Explanation: On the Moon, the Earth never rises -- or sets. If you were to sit on the surface of the Moon, you would see the Earth just hang in the sky. This is because the Moon always keeps the same side toward the Earth. 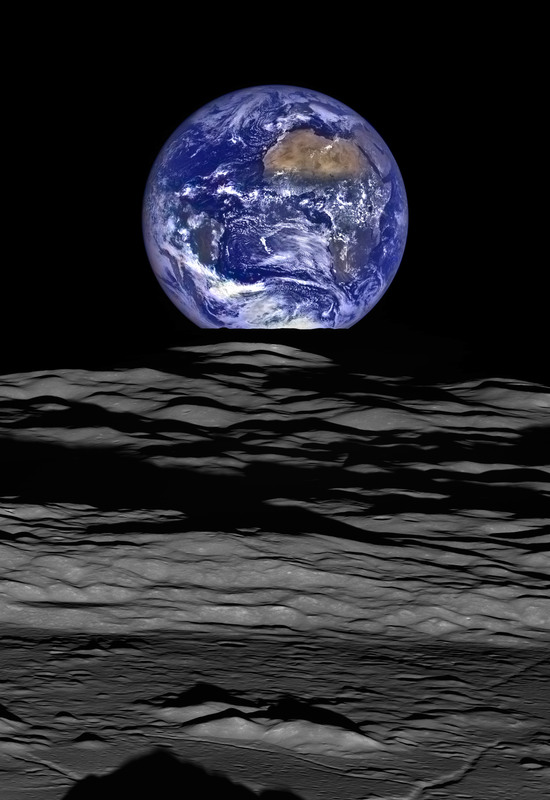 Curiously, the featured image does picture the Earth setting over a lunar edge. This was possible because the image was taken from a spacecraft orbiting the Moon - specifically the Lunar Reconnaissance Orbiter (LRO). In fact, LRO orbits the Moon so fast that, from the spacecraft, the Earth appears to set anew about every two hours. The featured image captured one such Earthset about three months ago. By contrast, from the surface of the Earth, the Moon sets about once a day -- with the primary cause being the rotation of the Earth. LRO was launched in 2009 and, while creating a detailed three dimensional map of the Moon's surface, is also surveying the Moon for water and possible good landing spots for future astronauts.